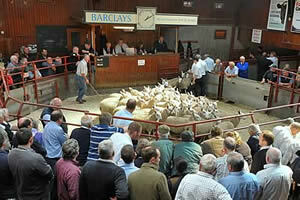 The Cumberland & Dumfriesshire Farmers Mart had forward 4,298 store lambs and 1,213 breeding sheep at their sale at Longtown on Tuesday 9th November, 2010. Stores met the dearest trade of the season with numbers short of requirements. Top of £76.50 for Beltex from Amos Hill; Texel £68 The Bloch, £67 The Hagg; Suffolk £65.20 Gillalees, £65 Willowford, £64 Leahill; Greyface £62.20 Gillalees, £61 Solwaybank, £60 The Gall; Cheviot Mule £60 The Gall; Charollais £60 Pates Hill; Blackface £53.50 Gillalees and The Hott, £52.50 The Gall, £52 Collinbank; Herdwick £45.50 Boat House; Swaledale £38.50 Wydon Eals. Cast ewes to £62 Home Farm and Coshogle. Hill Cheviots (1,489) also met the best trade of the year with new buyers to the fore. Top of £62.50 Whitstone Hill, £60 Bradley Farm, £59.50 Granton, £58 Meiklewhitriggs. Breeding sheep met another marvelous enquiry with all classes easily sold. Rams to £240 for North Country Cheviots from Alnham Castlehill; Suffolk £180 Drimmie; Texel £100 Harene; Blackface £90 Catslackburn. Ewe lambs sold to £86 for Beltex from Woodfoot Farm; Charollais £76 Woodfoot Farm; Texel £74 Patties Hill. Correct ewes to £67 for Hill Cheviots from Carpet Farm, £59 Bowershield, £56 Kilfinnan; Blackface £50 Carpet Farm.